A Shock Absorber, as its name suggests, absorbs shocks. This long cylindrical structure is joined with each of the four wheels in a vehicle and is filled with oil. The oil acts as a compressing agent absorbing impact so you don’t have to. When you drive your car down the road, you encounter speed bumps, potholes, gravel, rocks and what not. The shock absorber is your first defense against the jolts you feel from tackling these obstacles. Therefore, it goes through extensive wear and tear and over time it can disintegrate. The shock absorber leaks its oil and your smooth ride starts getting bumpy, the tires are not able to maintain their position on the road and you lose control and handling. Therefore, it is highly important to get your shock absorber checked if it shows any signs of wear. But in order to do that you need to know the symptoms of a bad shock absorber. When the shock absorber fails, you can feel it when you drive the car. Check the symptoms below to learn when a shock absorber fails. 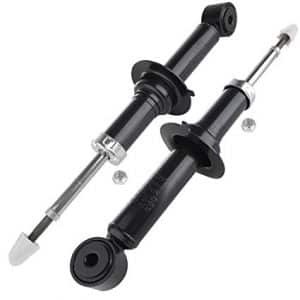 The shock absorbers attached to your car’s wheels act as agents that keep your vehicle on the road. If they fail you will feel their effect in the form of vibrations at the steering wheel. The seal that keeps the cylinder’s contents inside breaks and the oil inside breaks free. Since there is no compressing agent inside to contain the force felt from driving on bumps, the shocks behave erratically and you get an uncomfortable ride. One bad shock absorber might not make much difference, but if all four fail, you should visit the mechanic at the earliest. If the seal of the cylinder disintegrates and you brake hard, the piston inside can move with even the slightest of movements and force your car to swerve in one direction. To prevent such movement, you are forced to take precautionary measures and steer in the opposite direction. The same movement can also happen forwards, as when you apply brakes to your car the entire weight will shift forwards and the piston will cause your car to experience a nose dive. Since the entire suspension goes out of control with shock absorber failure, your car’s movement is severely affected. Not only will it take longer for you to stop your car the stop will make the car go out of your control. The shock absorber failure will also distort your wheel alignment which will cause irregular tire wear. There might be more wear on the inner or outer portion of the tire. Moreover, the tires will take a lot of abuse from the regular swerving you will have to avoid. 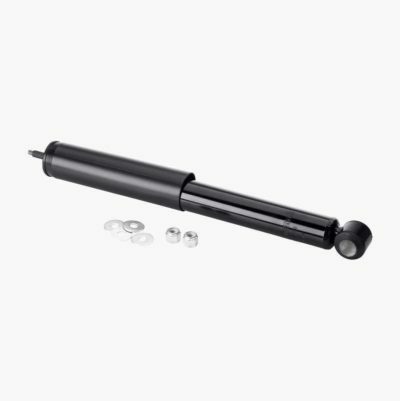 Take a look at the shock absorber behind your car’s wheels. It’s a cylindrical rod and very hard to miss. Shock absorbers are not usually exposed to any water splashes, but for the case of this test, first, ensure your car was nowhere near any liquid. Then check if there is any sign of leakages. If you find any lubricant stains on the shocks, there is a big chance your shock absorber has been compromised. The shocks have rubber bushings near its joints. These bushings can crack or break after exposure to several bumps and potholes. Usually, that happens after your shocks have gone bad. As a precaution, you should still replace the bushings and check if any of the above symptoms are also present. If your answer is yes, the shocks need a redo. It is not much you can do in terms of solving a bad shock absorber, except a few temporary adjustments until you really have to visit the mechanic. You have done everything from avoiding potholes and speed bumps to underdeveloped roads but still, there is no running away from a bouncy ride. It is time to take your car to the nearest mechanic. The mechanic can be your saviour in this situation, but first, you need to know if you can get away with a repair or a replacement is needed. If you are looking to get your suspension repaired, you are looking for a very cheap solution. Shock absorbers are not very hard to repair. After all, you may only have to get the seal replaced by a new one if you are lucky. A good service by the mechanic and the replacement of the seal can solve your problems and the shock absorber will return to its original working condition. This process will require a few hours since it involves the dismantling of your major suspension parts and then their repair. While you are it, think about getting your tie rod, struts and sway bars inspected. These parts are joined with the shocks thus if they are getting off you might as well spend money to get these parts checked. Labor for this kind of work will cost you around $100 to $150. However, if your mechanic decides that your old shock absorbers are beyond repair, it is time to look for a replacement. Shock absorbers are generally expensive and if you add other factors like availability to the mix, you can see the price skyrocket. Remember, the cost of repairs is directly dependent on the make and model of your vehicle as well as its size. In general, a replacement will shock absorber will cost you from $200 – $1200. That’s a good price, but if you are looking at multiple shock absorbers changes, it is bad news.